A TRY from Abbey’s Dave Canham on the stroke of full time snatched victory in a thrilling derby clash at Rosehill in a match that see-sawed throughout. The result leaves Reading still seeking their first win of the season in the Wadworth 6X Southern Counties North division whilst Abbey’s man-of-the-match fullback Jules Greenaway scored two tries and laid on the third. Abbey were depleted by the social calls of two weddings, leading to eight changes from their regular line-up and giving three players their first team debuts. Maurice O’Connell in the second row took the captaincy as captain in the absence of Will Bevan. The start was ominous for Abbey as the expected forward dominance of the Reading pack was evident from the outset, taking advantage of Abbey’s re-arranged front row. The opening saw Reading well on top, confidently putting four successive penalties into touch, aiming for the subsequent catch and drive, but to no avail. The visitors failed to find the try line until the 22nd minute, centre Alex Dorliac running home having been put clear by his centre partner George Dear, with scrum half Guillaume Janvin who took the extras then a penalty on the half hour. The time delay in scoring allowed Abbey to settle to the task, conquering early nerves and benefiting from a shuffled front row as Ollie Charlton replaced Ross Orrburns. 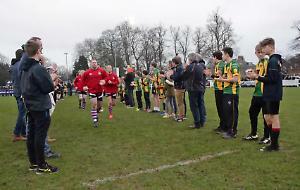 Abbey made their response; it was their turn to dominate as their pack established a platform for possession, flanker Jack Brown revelling in his non-stop work. With half-time approaching fullback Greenway collected a chip ahead from outside half Theo Evered to cross the whitewash wide out on the right. The kick went astray but the pressure was pumped up as Abbey’s young side increased the pace, scrum half John Maliviore on his debut capturing his chip ahead but tackled short of the line. Two attacking scrums for Abbey followed, but the advantage wasn’t pressed home. A penalty out wide was put into touch for the subsequent drive, but the visitors held out, and when Abbey had a clear overlap, it was spurned for a step inside only to hit the last defender. Maurice O’Connell crossed the line in the dying seconds, but the referee adjudged he had touched down short and he disallowed the second movement. Half-time saved Reading and their lead of 10-5. Abbey were quick out of the blocks for the second half and another strong run from Greenaway made good ground to put away winger Dave Canham, but he was called back as the touch judge spotted a foot in touch. Centre Ollie Walton kept the momentum with two penalties grabbing the lead for the home side by a single point. Now it was Reading’s turn to turn the screw. They stole Abbey’s line-out ball, barged through the centre and released winger Will Proctor-Smith to race home for the unconverted try that restored the visitors’ lead. Reading held the lead for just four minutes. A clearance kick failed to find touch, and Greenaway ran back strongly, chipped the ball over the advancing defence, did enough juggling to keep possession then put down the try that provided Walton with an easy conversion to go back in front by three points. It was now that Abbey supporters appreciated Jim Dye coming off the bench at half-time, his measured play, and touchline kicking and assured presence boosted confidence. The Rosehill faithful had their worries when second row man Chris Shaw was yellow carded for persistent offside play. Reading were soon to take advantage of their extra man when number eight Jamie McNab stepped through a ruck to see the line before him; an easy touchdown. Scrum half Janvin added the two points to impress on his debut; so Reading now had the lead by a crucial four points with eight minutes remaining. Abbey were satisfied that the man advantage to Reading had been limited to one score, but they needed more than a penalty, urgently. As at the end of the first half Abbey’s youngsters upped the pace, their forwards camping five metres out and the backs sprayed the ball around. Reading’s defence absorbed the strain, looking as though they would see time out. Abbey’s man-of-the-match Greenaway came to the rescue, joining the line on the left to draw the defence, feeding the pass to winger Canham to dab down the last gasp winner. Abbey: Russ Orrburns, Adam Postlethwaite, Ed Woodger, Maurice O’Connell, Chris Shaw, Jak Brown, Matt Simmons, James Wisener, John Maliviore, Theo Evered, Alex Langford-Pollard, Ollie Walton, Charlie Shackleford, Dave Canham, Jules Greenaway. Replacements: Ollie Charlton, Max Courtnage, Jim Dye.